Over the last eight seasons, Mathieu Dandenault has established himself as “a dependable defenseman with good offensive upside and a good skater,” in the words of one scout. 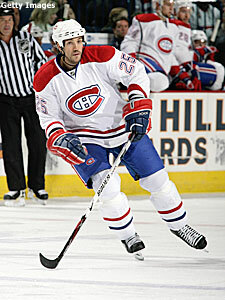 After being drafted 49th overall in the 1994 NHL Entry Draft by the Detroit Red Wings, Mathieu Dandenault, then a forward, exploded for 107 points the following season with Sherbrooke in the Quebec Major Junior Hockey League. But a career as a high-scoring forward wasn’t to be. In 1995-96, Dandenault got his shot at the NHL, playing 34 games up front for Scotty Bowman and the Red Wings. He moved to defense in 1996-97, then back to forward before finally settling in on the blue line in the 1998-99 season. Over the last eight seasons, Dandenault has established himself as “a dependable defenseman with good offensive upside and a good skater,” in the words of one scout. But in strange twist of fate, Dandenault once again is skating as a forward for the Montreal Canadiens. Heading into tonight’s game with the Islanders, Dandenault has only five points in 20 games, but he feels at home again playing wing and is enjoying doing the little things needed to succeed as a forward in the League. “I had no problem being in the right position at first because I’ve done this before,” Dandenault said. “But it’s a different game now with the rules and there’s the little things, some of which were there before and some that weren’t, that you have to get used to again and really focus on. Making the right play or move at the right time, getting shots and creating chances for yourself and your linemates. Stuff like that. The Canadiens are off to a fast start and many are crediting the chemistry in the dressing room and the players’ willingness to sacrifice for one another. Dandenault’s acceptance of this move was a perfect example of that. As Carbonneau pointed out, Dandenault’s previous experience and versatility made him a perfect candidate and also makes him a very valuable asset to have on the roster. “In a cap situation, it makes him that much more valuable and it’s been huge that he’s doing this for us,” Carbonneau said. Who’s Hot? -- After breaking a six-game scoreless streak and adding two assists in a 4-2 win over the Canadiens Monday, Senators winger Dany Heatley has five points (one goal, four assists), in his last three games. Bruins winger Glen Murray broke an even longer scoreless streak this past week when he scored twice and added an assist in a 7-4 loss to Montreal Saturday. Murray had gone 13 games and five weeks without a goal. Murray has two goals and three assists in his last three games. Center Marc Savard set up both of Murray’s goals in Montreal and had a huge week himself with a goal and five assists. Bruins captain Zdeno Chara also had a good week offensively with a goal and three assists. Toronto defenseman Bryan McCabe has been creating offense, as he had a goal and three assists this past week. Montreal defenseman Marc Streit continues to impress as he had three assists, two of them coming in that win over Boston Saturday. Boston -- Reports out of Boston continue to indicate that center Patrice Bergeron, on injured reserve with a concussion and broken nose, will be out indefinitely. Goaltender Manny Fernandez is going through training to avoid such a fate as he remains on injured reserve with a knee injury. Defenseman Andrew Ference is day-to-day with a knee injury, but he could miss up to four weeks. Forward Shawn Thornton is out indefinitely with a broken bone in his left foot. Buffalo -- Reports out of Buffalo are that center Tim Connolly could be back as early as tonight, when the Sabres host the Senators. Connolly has missed the last five games with a strained oblique muscle. Forward Adam Mair is still day-to-day with a sprained right ankle. Defensemen Dmitri Kalinin (knee) and Teppo Numminen (heart surgery) remain on injured reserve. Toronto -- Defensemen Carlo Colaiacovo (knee) and Pavel Kubina (right MCL), still are on injured reserve, while forward Chad Kilger is day-to-day with a leg injury. The week ahead -- Montreal travels to Long Island to face the Islanders tonight and the Senators are in Buffalo. The Senators will host Sidney Crosby and the Penguins Thursday night. Friday, the Bruins welcome the Islanders to town for a noon matinee and the first game of a home-and-home. For a second- straight Friday, Montreal will be at Buffalo, but this week’s game at HSBC Arena is the first of a home-and-home with the Sabres. The Leafs begin a Western Conference road trip in Dallas Friday. Saturday, Toronto continues its trip against the Coyotes in Phoenix. The Senators will host the Flyers, and the Canadiens finish their home-and-home set with the Sabres, as will the Bruins with the Islanders. On Monday, the Bruins will face the Flyers in Philadelphia. The Canadiens and Maple Leafs will meet at the Air Canada Centre Tuesday night and add another chapter to their storied rivalry as the Toronto tries to avenge a 3-2 loss to the Habs two weeks ago.